This play gym is bursting with dynamic friends, including a hooting owl, a musical hedgehog, a dancing fox and more! 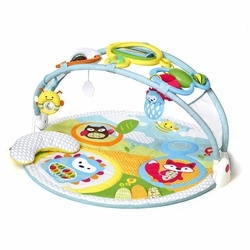 Position the arch overhead for newborn exploration, then bring it down for tummy time or to convert to a seated floor activity center. Slip your phone in behind the mirror to record those special milestones or let grandma observe the action from afar! Baby will think he's looking at a mirror– and not your camera– which means you'll capture some truly amazing moments! 20 developmental activities include: sound-activated dancing fox, pull-string peekaboo owl that hoots, hanging hedgehog musical teether and more! Three AAA batteries required (not included). Do not use in cribs or playpens. Use this product only on the floor. Never leave baby unattended on mat.